Vendors, the individual that signed the vendor contract & agreement must check in at the head table before setting up their booth. Vendor booth # assignments are subject to change. 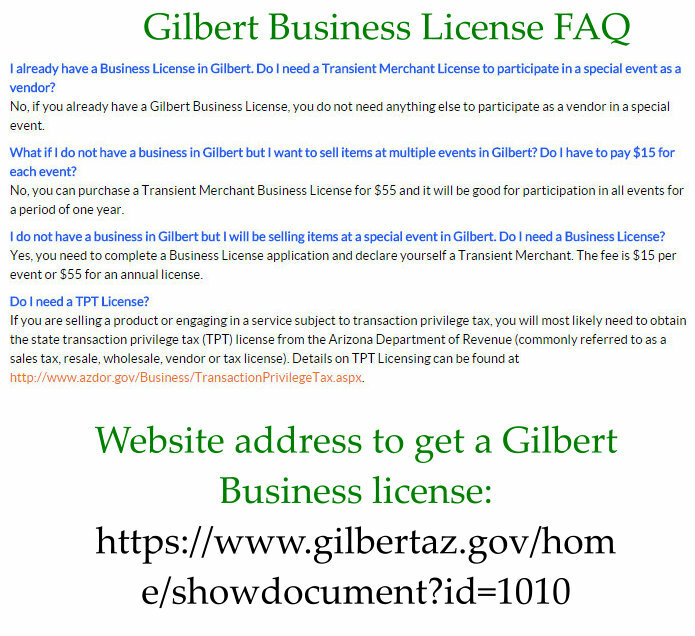 If you are participating in any of our Gilbert, AZ vendor events, you will need a Town of Gilbert Business license. You can call the Town of Gilbert at 480.503.6700 or email them at businesslinks@gilbertaz.gov to check the status of your business license application. Most business license certificates are issued within 7 working days of receipt of an application. Your license will be sent to you via email. If you have not given us an email address, your certificate will be mailed via USPS. You must print out your certificate and place it in a conspicuous place within your business space. Vendor booth assignments are not made until the week of the event. Make sure you check your email for details on booth assignments, set up instructions, etc. the week of the vendor event. ***Make sure your email is set to receive emails from info@thepaisleypumpkin.com.